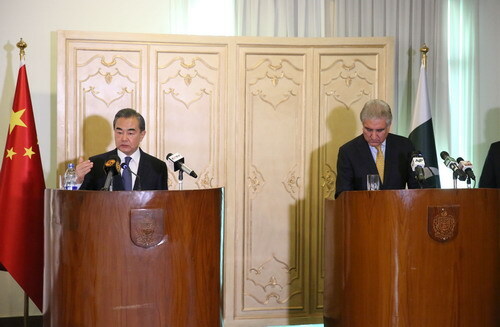 On September 8, 2018, State Councilor and Foreign Minister Wang Yi met the press together with Foreign Minister Makhdoom Shah Mahmood Qureshi of Pakistan in Islamabad, and introduced the ten important consensuses reached by the two Foreign Ministers on comprehensively deepening China-Pakistan all-weather strategic cooperative partnership. The first is to deepen strategic mutual trust and strengthen strategic communication. The two sides should support each other's core and major interests more firmly and communicate and coordinate more closely on major issues of common concern. The Chinese side welcomes Prime Minister Imran Khan of Pakistan to attend the first China International Import Expo and pay an official visit to China in November. The second is to better promote the construction of China-Pakistan Economic Corridor (CPEC). The normal operation of the completed project and the smooth progress of the project under construction will be ensured. At the same time, according to the next economic and social development priorities and the needs of the public of the Pakistani side, the future development path and cooperation direction of the CPEC will be determined through consultation. Speeding up industrial cooperation and livelihood projects, and gradually extending to the western region of Pakistan are the main focuses. The third is to strive for balanced development of bilateral trade. China will expand imports from Pakistan by sending purchasing teams and other means to provide greater convenience for Pakistan's agricultural products to be exported to China and make efforts to narrow Pakistan's trade deficit with China. The two sides strive to complete the negotiations on the upgraded version of the China-Pakistan free trade agreement within this year to further enhance the level of trade liberalization between the two countries. The fourth is to vigorously carry out capacity cooperation. The Chinese side will support the Pakistani side in developing its own manufacturing industry, improving its capacity for independent development, increasing employment and export, and accelerating its integration into the international industrial chain. The fifth is to strengthen development cooperation with focus placed on people's livelihood. The Chinese side will provide more aid to Pakistan in agriculture, education, health care, drinking water and other areas of people's livelihood, so that more people will receive tangible benefits and well-being. The sixth is to strengthen defense and security cooperation. Exchanges between the militaries and law enforcement agencies of the two countries will be promoted to resolutely combat the terrorist forces of the East Turkestan Islamic Movement. The Chinese side will support the Pakistani side in continuing to firmly combat terrorism according to its national conditions. The seventh is to strengthen exchanges of experience in state governance and administration. The Chinese side is willing to hold seminars on such fields as poverty alleviation, anti-corruption and economic development according to the needs of the Pakistani side, and build demonstration projects for poverty alleviation in Pakistan. The eighth is to expand people-to-people and cultural exchanges. The scale of mutual visits between the youth of the two countries will be maintained and expanded and cooperation in vocational education will be strengthened. The Chinese side will continue to take steps to provide more visa facilitation for Pakistani citizens to come to China. The ninth is to strengthen cooperation in international and regional affairs. We will jointly promote the reconciliation process in Afghanistan, oppose trade protectionism, unilateralism, cold-war mentality and power politics, and promote the building of a new type of international relations and a community with a shared future for mankind. The tenth is to inherit the past and usher in the future to elevate China-Pakistan all-weather strategic cooperative partnership to new highs, forge a closer China-Pakistan community of shared future, thus making contributions of the two sides to the building of a community with a shared future for mankind.